♬☀【FEATURE】 - foldable arm , small size , easy to carry , aerial photography beauty mode , Light weight airframe with nice durability. 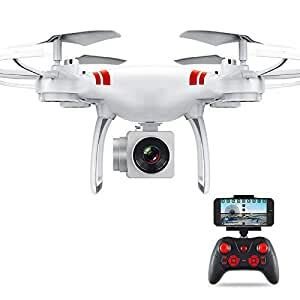 ♬☀【PERFECT DESIGN】- The Gravity Sensor Mode , Two remote control ways are available,RC control mode and gravity control mode , Innovative 720P selfie drone. ♬☀【PERFECT GIFT】- Mobile phone WiFi control ,FPV by mobile phone screen , With trajectory flight mode , 4 Channel which can do ascend, descend, forward, backward, left sideward fly, right sideward fly and rolling 360. ♬☀【FUNCTION】- 3D rollover,Camera,Forward/backward,FPV,Gravity Sense Control,Headless Mode,One Key Automatic Return,One Key Taking Off,Sideward flight,Turn left/right,Up/down,WiFi Connection,With light. 1.WIFI FPV with 2.0~3.0MP HD adjustable camera. 2.With High Hold mode can set height. 4.Strong stability,can easily implement various flight 6.movements, stronger wind resistance, easier to control. 5.The quadcopter can fly both indoor and outdoor.Including 4CH digital proportional RC system. the actual color of the item.